Hi everyone! As promised, Wednesdays will be devoted to reviews- new products, new places, new classes...something new each week! The first installment will be of an exercise class that's offered at my gym called Group Centergy. Enjoy! To start things off, I am by no means a "yogi". 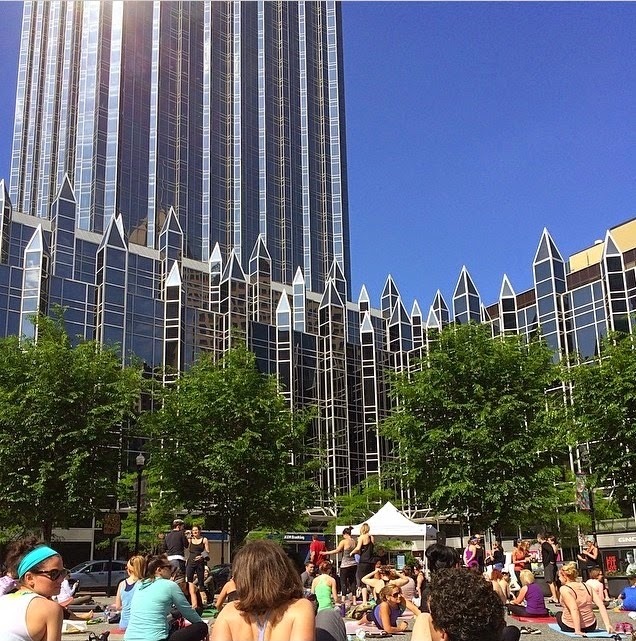 I started doing yoga in the summer, when Pittsburgh held free yoga classes every Sunday at Market Square (sponsored by Lululemon). Beautiful place for a yoga class! I figured I would try it out since it was free, plus I was living downtown at the time. I really enjoyed it, but yoga studios are EXPENSIVE to join, and I wanted to join a gym that offered other classes and also had a cardio area. Here’s a video that shows what to expect from the workout. This workout is similar to a popular class called PiYo (short for Pilates Yoga). Here's some info from the website: "With every action-packed PiYo session, you can burn excess fat and sculpt and define your whole body, as you minimize the aches and pains that can come along with high-impact workouts. No matter your age, no matter your body type, PiYo will help give you dramatically visible, incredibly beautiful results." Sounds good to me! PiYo DVD’s can be found on Amazon here, or you can try out some routines on YouTube (my favorite source for at-home workouts!) You can also check out if there are Centergy classes around you here! I think this class sounds awesome. Hip openers are also my favorite, but the sequence seems like a really good one with lots of variety. What gym do you go to?